Project Roar Publishing is dedicated to preserving the history of hobby collectibles, in particular, the miniature electric trains produced by the Lionel Corp., through careful use of original documents and expert observations. 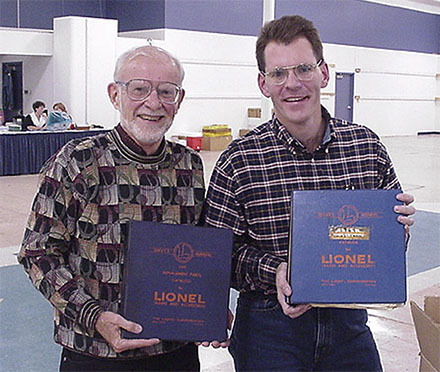 Project Roar was founded in 2001 with the acquisition of postwar Lionel® production records. Since then, many more internal documents have been uncovered and acquired so that a unique research facility has developed. Project Roar has never veered from its original goal of analyzing the original Lionel documents and disseminating the information learned and conclusions drawn. The result of its endeavors has been authoritative publications that can be passed down to future generations. See our Online Store for a list of our books and related documents. 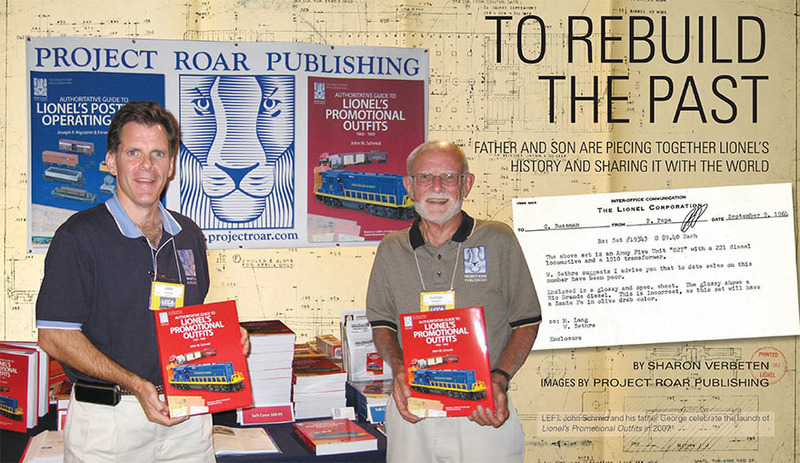 Project Roar Publishing was founded in 2001 when postwar Lionel Factory Orders were acquired at auction. The information contained in these documents needed to be in the hands of toy train enthusiasts who would enjoy and cherish it and not keep it locked away. We at Project Roar intended from the beginning to share what was learned by publishing these documents and the findings drawn from them. We would therefore be able to enlighten the entire collector community. The best way of accomplishing our goals was to form our own publishing company. For our logo, the lion and its roar were natural choices. Hence the "project" we were working on and the lion's "roar" became Project Roar Publishing. Since that day in September 2001 when the auction was held, many friends, colleagues, collectors and former Lionel employees have stepped forward to generously assist in our many projects. Numerous other pieces of actual documentation were gathered so we could develop a library aimed at preserving the history of model train manufacturers. For our first publication, we teamed with two leading postwar Lionel historians, Joseph P. Algozzini and Emanuel F. Piazza. Leveraging actual production documents, the Authoritative Guide to Lionel's Postwar Operating Cars was published in 2005. Our second publication, the Authoritative Guide to Lionel's Promotional Outfits 1960 - 1969, written by Project Roar founder and Lionel historian John W. Schmid, shares the wealth of information included in the Lionel Factory Orders. Our third publication, Inside The Lionel Trains Fun Factory: The History of a Manufacturing Icon and The Place Where Childhood Dreams Were Made, by Robert J. Osterhoff, delivers a fascinating trip through the rise, fall and rise again of Lionel, one of the manufacturing and pop icons in modern American life. Our mission is to continually create fact-based publications that use actual documents as well as the expert observations of leading historians.